Makers plant to partner on hybrids and electric car technologies. BMW will produce the Megacity urban battery-electric vehicle at its plant in Leipzig, Germany. The electrification of the auto industry is clearly making for some strange bedfellows. We’ve seen Toyota team up with the California start-up, Tesla Motors – which has also been working with Daimler on battery car technology for its Mercedes and Smart brands. Ford is partnering with Magna and Azure Dynamics. Chrysler will take lead in developing battery technology for its partner Fiat. Nissan and European partner Renault have major plans for battery vehicles – and have also partnered with Daimler. Now comes official confirmation that BMW will be allying itself with the French PSA Peugeot Citroen in a partnership that will help both manufacturers ramp up their hybrid efforts. The new agreement expands upon a more limited battery car program they had tentatively initiated last autumn. The 50-50 joint venture, dubbed BMW Peugeot Citroen Electrification, will focus on developing and producing everything involved in electrification, from battery packs to motors, chargers all the way to the sophisticated software needed to make the systems run smoothly and efficiently. The partners want to come up with an array of hybrid systems that will be able to plug-and-play with a wide variety of different BMW, Citroen and Peugeot vehicles. While they are focusing on hybrid systems, it is believed likely they will also cooperate on more advanced battery-based propulsion systems, including plug-ins and pure battery-electric vehicles, or BEVs. Peugeot took things to extremes, starting with the exotic electric EX-1, at last year's Paris Motor Show. “This cooperative venture will enable us to achieve significant economies of scale in the field of electrification. It also represents an important step on the road to sustainable mobility,” said BMW Chairman Norbert Reithofer. “With this joint venture, we are sure to develop and expand our expertise and to build a European leader in the field of automotive hybrid innovation,” added his PSA counterpart, Philippe Varin. If all goes according to plan, the joint venture will be up-and-running before the year is out and supplying both makers with hybrid technologies by 2014. So far, 100 employees have been assigned to the project, with more likely to be hired on as it ramps up. The partnership is actually just the latest alliance between the two companies. BMW and PSA first teamed up in 2006 and have so far produced 1.8 million engines for their Mini, Peugeot and Citroen brands. A year ago, they agreed to develop a more advanced model. Along with improved economies of scale, BMW and PSA are hoping to take a leading role in setting up standards for the still nascent battery car market. Though slow to initially embrace battery propulsion, BMW is rapidly ramping up its efforts. It has launched several hybrids initially using technology developed as part of a short-lived joint venture with General Motors, Chrysler and Daimler. 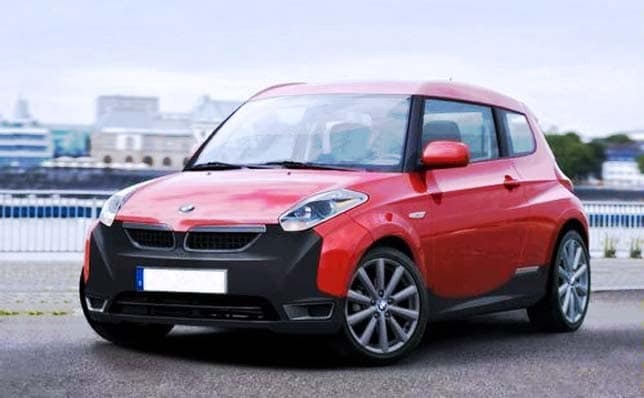 It has been experimenting with pure battery power for both the BMW and Mini brands. And it is planning to launch the MegaCity sub-brand, which will focus primarily on battery-electric vehicles designed for use in dense urban markets. The new joint venture could be a critical component of that effort, which will need not just new technology but a low-cost source to keep its products competitive with more conventional powertrain systems. The Mini brand reportedly will be one of the first to tap the joint venture, however, with a hybrid drivetrain for either its new Countryman SUV or a spin-off model. PSA Peugeot Citroen has also formed a battery technology partnership with Japanese maker Mitsubishi, which is preparing to launch a new global BEV, the iMiEV, and several other electrified models. The French maker has a number of hybrids targeted for its line-up, notably including several super-high-mileage diesel-electric offerings. This entry was posted on Wednesday, February 2nd, 2011 at and is filed under Automobiles. You can follow any responses to this entry through the RSS 2.0 feed. Both comments and pings are currently closed.